What lies below your concrete slab is critical to a successful job. This is no different than the foundation for a building. A slab on ground (or slab on grade) by definition is not intended to be self-supporting. The "soil support system" beneath it is there to support the slab. The only layer that is absolutely required is the subgrade—you have to have ground to place a slab on ground on top of. If the natural soil is relatively clean and compactable, then you can put a slab right on top of it without any extra layers. 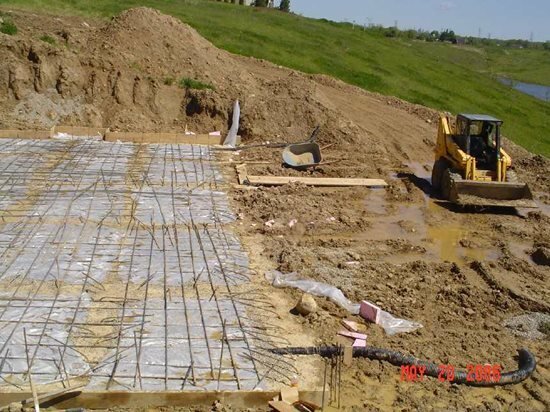 The problems with that are that the soil may not drain well and it can be muddy during construction if it gets wet, it may not compact well, and it can be difficult to get it flat and to the proper grade. Typically, the top of the subgrade should be graded to within plus or minus 1.5 inches of the specified elevation. A subbase and base course, or both, provide several good things. The thicker the subbase, the more load the slab can support, so if there are going to be heavy loads on the slab—like trucks or fork lifts—the designer will probably specify a thick subbase. A subbase can also act as a capillary break, preventing water from wicking up from the groundwater table and into the slab. 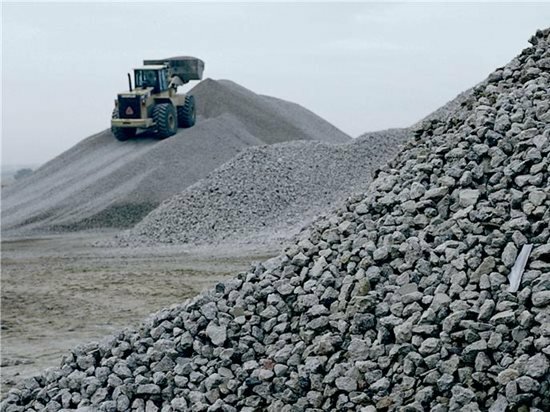 The subbase material is usually a reasonably low cost gravel without a lot of fines. A base course on top of the subbase makes it easier to get to the proper grade and to get it flat. If you use some sort of a choker course of finer material on the top of the subbase, it will support your people and equipment during concrete placement. It will also keep your slab thickness uniform, which will save money on concrete—the most expensive part of the system. 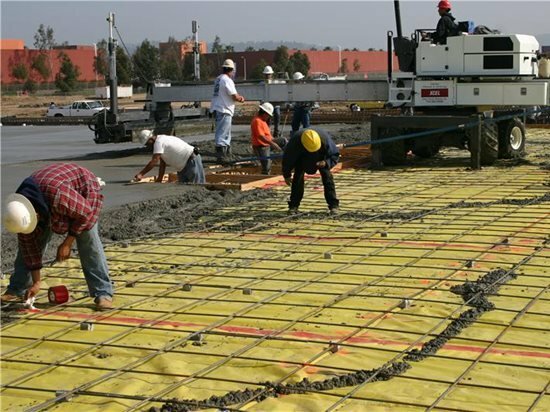 A flat base course will also allow the slab to slide easily as it shrinks, reducing restraint and the risk of cracks as the concrete contracts after placement (drying shrinkage). The entire subbase and base system should be at least 4 inches thick—thicker if the engineer feels it is needed for proper support. The base course material, according to ACI 302, "Concrete Floor and Slab Construction," should be "compactible, easy to trim, granular fill that will remain stable and support construction traffic." ACI 302 recommends material with 10 to 30% fines (passing the No. 100 sieve) with no clay, silt, or organic materials. Manufactured aggregate works well—crushed recycled concrete aggregate can also work well. Tolerances on the base course are +0 inches and minus 1 inch for Class 1 through 3 floors (typical low tolerance floors) or +0 inches and minus ¾ inches for higher tolerance floors. The weight of the slab and anything on top of it is going to eventually be supported by the soil. When a building site is excavated, usually the soil gets moved around—high spots are cut and low spots are filled. Everything then should get compacted before you place the concrete, subbase and base. Organic soils, what you might call top soils, are great in your garden, but awful beneath a slab. Organic soils can't be compacted and must be removed and replaced with a compressible fill. 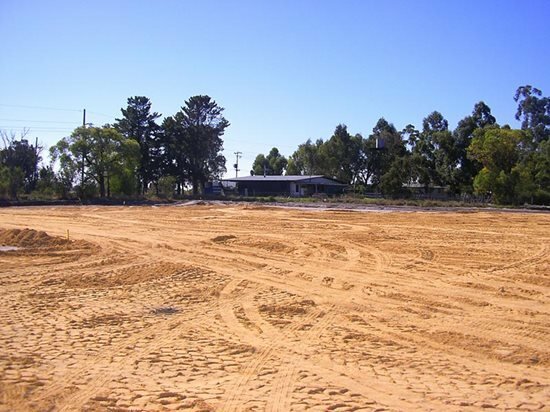 Granular soils are sand or gravel. You can easily see the individual particles and water drains quite easily from them. Just like at the beach when you make a sand castle, if you take a wet handful of granular soil and make a ball, as soon as it dries it will crumble. Granular soils have the highest bearing strength and compact easily. Cohesive soils are clays. If you take a wet handful, you can roll it into a string just like with modeling clay. It has a greasy, smooth feeling between your fingers and individual particles are too small to see. Cohesive soils are often difficult to compact and take on a rock-hard consistency when dry, but they have a lower bearing strength than granular soils. Some clays expand when wet and shrink when dry making them particularly difficult as subgrade materials. The best way to counter this problem is first with good compaction, then to not let them get wet (by providing drainage). But as the ground beneath the slab dries over time, it will shrink and the slab will sink. That's not a big problem as long as the slab is isolated from the footings and columns and from any pipes that penetrate the slab so that it can settle a little and settle evenly. Often, with expansive clays, the best approach is a structural slab that doesn't bear on the soil at all or a post-tensioned slab that floats atop the soil but doesn't rely on it for structural support. Most natural soil, of course, is a mixture and so is characterized by the type of material that is predominant. The amount of weight the soil can support before it fails is its bearing capacity, typically given in pounds per square foot. The design, however, is based on the allowable soil pressure, which adds a safety factor to the ultimate bearing capacity. Let's look at the weight the subgrade soil will typically need to support. A 6-inch-thick slab weighs about 75 pounds per square foot. According to the International Residential Code, the live load (anything that is not part of the building itself), varies from about 20 to about 60 pounds per square foot—50 pounds per square foot in a garage. That gives us 125 pounds per square foot for the soil to support. A clean sandy soil might have an allowable soil pressure as high as 2000 pounds per square foot. Even a poor soil—silt or soft clay—might have an allowable soil pressure of 400 pounds per square foot. We can see then that the allowable soil pressure for a slab is seldom a problem. However, there is a need for uniform support because if one part of the slab settles more than another, that's when we get bending in the slab—and potentially cracks and differential settlement. Knowing which areas have been cut and which filled is important—make sure the fill areas have been well compacted. In fact, any soil that's been disturbed during excavation must be compacted. The key for the soil support system is uniform support rather than strong support. Sure, it has to be able to support the slab, and on most ground that's not a big problem, at least across the middle of the slab, since the load is spread across so much area. Good strong support at the edges and at any joints can be a different matter—to prevent cracking and joint spalling we need to support the slab at those locations where it can behave like a cantilever and bend into the subbase. But with a good subbase that's really not a big issue either. 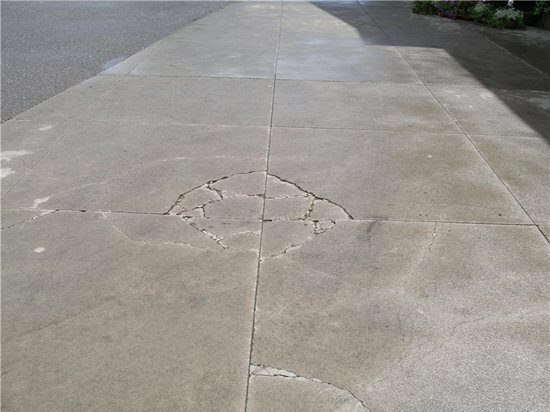 What happens to a concrete slab if support isn't uniform? Concrete is very strong in compression and not so strong in tension. In a slab, tension is often created by bending. When a piece of concrete bends, it is in compression on one side and tension on the other side. A concrete slab may bend concave up (like a smile) if the subgrade has a soft spot in the middle, putting the bottom in tension. It may bend down (like a frown) at free edges or at joints, putting the top in tension. So if your entire concrete slab isn't being supported from below, by the "soil support system," it's going to bend more easily and is probably going to crack. Why do the subgrade and subbase allow the concrete to move at all, shouldn't it be completely rigid? The fact is that any soil or gravel base course is going to compress if the load is high enough, unless the slab is placed on solid rock. And in some ways that's good, because slabs curl and if the base can deflect a little, it can continue to provide support for the slab even when it curls. But if it doesn't provide uniform support, if the slab has to bridge over soft spots, the slab will probably crack. There doesn't even need to be much of a load on the slab--its own weight is usually enough since a slab on grade is not typically designed to even carry the dead load. And when it does crack, that crack is going to go all the way through the slab. If the under-slab support is bad enough, you can then get differential settlement across the crack that leaves a very unfortunate bump and a very unhappy owner. HOW DOES THE SUBGRADE/BASE AFFECT SLAB DESIGN? We go to all this effort to get the proper soil support system and what we end up with is a single input value for the slab design. The most commonly used value is the modulus of subgrade reaction, k. This value is not directly related to bearing capacity and k does not tell the designer if there is compressible or expansive soil. What it does is indicate how stiff the subbase/subgrade is over small deflections (about 0.05 inches). Now let's look at why we need to know how flexible the subgrade is. To start with it's important to understand that a slab on ground is designed as "plain" concrete. That means that we do not count on the reinforcing steel to carry any of the load. But wait, you say, there's steel in the slab—mesh and rebars. Yes, but that steel is only there for crack control—to hold any cracks tightly together. It normally does not extend through the joints—at joints we only want to transfer shear forces, not bending moments and certainly not lateral restraint. That's what the joint is there for in the first place, to allow lateral shrinkage in the slab. If the subgrade settles under the middle of the slab or at the edges, the unsupported portion can lead to cracks or slab failure. So if we aren't counting on the steel to carry any load, then the concrete has to be strong enough to carry the bending. And the support it is getting from below determines how much it will bend. As we've already discussed, concrete isn't that strong in tension, and since half of bending is tension, it's not that strong in bending. What makes it stronger in bending, though, is a thicker slab. The weaker the subgrade, or the heavier the loads, then, the thicker the slab needs to be. Concrete strength also comes into play, but most slab concrete is around 3000 to 4000 psi, so it's not a major factor. The tensile strength of concrete is typically taken as 10 to 15% of the compressive strength, so only about 400 or 500 psi. Compare that to the tensile strength of Grade 60 rebar, which is 60,000 psi. The thing to remember here is that a concrete slab is intended to be rigid, but we don't expect the base to be infinitely stiff. A slab will settle a little and that's OK from a design standpoint—again, as long as the settlement is uniform. The danger, though, is at the edges of the slab or at joints that are wide enough to let the slab on either side settle independently. At those free edges, the weight the slab can carry depends on the stiffness of the base and the flexural strength of the slab, which is mostly a function of slab thickness. Read Preventing Concrete Cracks for more information. HOW CAN WE IMPROVE THE SUBGRADE? Most subgrade improvement is accomplished by compacting the soil. In extreme situations, when the soil is particularly bad or the loads high, soil stabilization can be used. In this process, portland cement, calcium chloride, or lime are mixed into the soil then it is compacted. The subgrade soil can also be excavated and mixed with gravel then compacted. For some difficult soils, the subbase may be placed atop a layer of geogrid. How much a soil can be compacted is measured by a geotechnical (or soils) engineer by placing the soil in a cylinder and beating on it—seriously. The standard or modified Proctor tests (each uses different weights to compress the soil) determine the relationship between soil density and moisture and tell us the maximum reasonable soil density that can be achieved in the field. What we are trying to determine with the Proctor test is the moisture content in the soil that will make it easiest to compact and result in the highest density—remember that density is directly related to compaction. Too little moisture and the soil is dry and doesn't compress easily; too much moisture and you can't easily squeeze the water out. To get the best compaction, the optimal moisture content will typically be in the range of 10% to 20%. 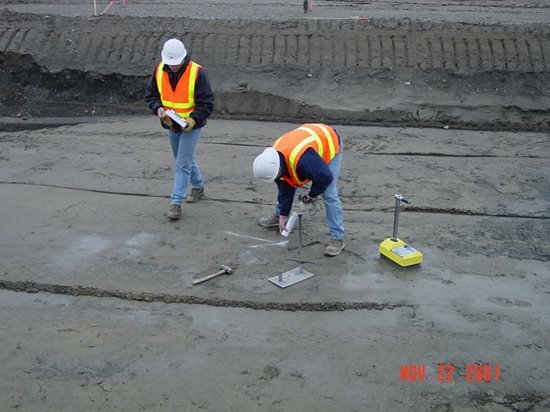 So when you hear that according to the specification the soil needs to be at 95% of the maximum modified Proctor density, you will know that you need the moisture content to be about right in order to get to that level of compaction. 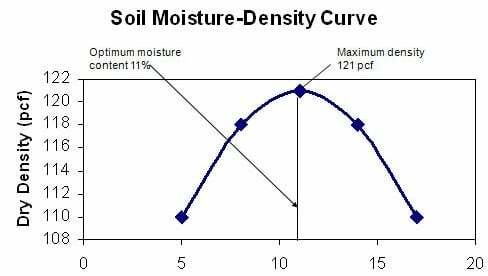 A soil density-moisture curve defines the optimum moisture content and the maximum density achievable in the field. For moisture content use the hand test. Squeeze a ball of soil in your hand. If it's powdery and won't hold a shape, it's too dry; if it molds into a ball then breaks into a couple of pieces when dropped, it's about right; if it leaves moisture on your hand and doesn't break when dropped, it's too wet. Also, remember that it's not just the soil (the subgrade) that needs to be compacted. Any subbases or base courses, which will typically be granular materials, also need to be well compacted in the proper lift thicknesses. See more on building high-quality slabs on grade. 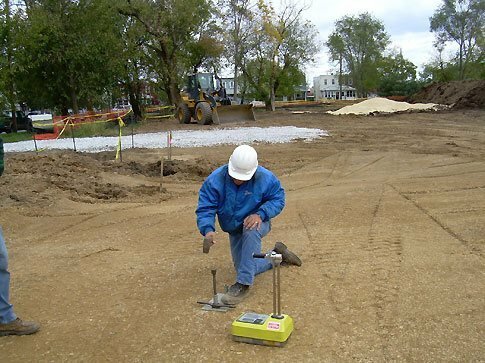 There are two ways to compact the soil or subgrade—static force or vibratory force. Static force is simply the weight of the machine. 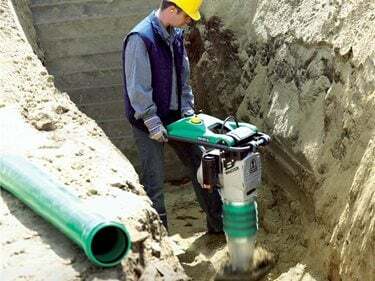 Vibratory force uses some sort of mechanism to vibrate the soil, which reduces the friction between the soil particles, allowing them to squeeze together more easily. Cohesive soils need to be sheared to get compaction, so you need a machine that has high impact force. A rammer is the best choice, or for bigger jobs, a pad-foot roller (similar to a sheepsfoot roller). Lifts for compaction of cohesive soils should be no thicker than 6 inches. Granular soils only need the particles to be vibrated to move them closer together. Vibrating plates or rollers are the best choice. Lifts for gravel can be as thick as 12 inches; 10 inches for sand. 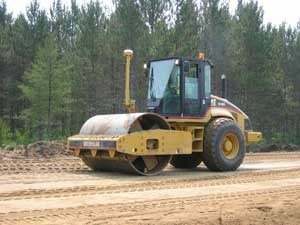 For big jobs, such as highways or large slabs, big ride-on vibratory rollers, either with smooth rollers or sheepsfoot rollers, are used for compaction. Walk-behind rollers, either with padded rollers that knead the soil, or with smooth vibrating rollers, are good for medium-sized jobs. For smaller jobs, the two most common types of compaction equipment are vibratory plate compactors (either one-way or reversible) and rammers. Static force is sometimes sufficient for compaction of granular soils. Minnesota DOT Sheepsfoot rollers are used to compact cohesive soils. Rammers, sometimes called jumping jacks, vary in weight from about 130 pounds to 185 pounds. These tools are great for compacting the soil in a footing trench or for cohesive clays in smaller areas since they deliver a high impact force (high amplitude, lower frequency). They are not good for compacting granular materials-such as base courses. Vibratory plates are ideal for compacting granular soils and subbases. Available in weights of 100 to 250 pounds with plate size of 1 to 1.5 feet by 2 feet. The vibration is at a lower amplitude but higher frequency than with a rammer and is balanced to cause the machine to move forward. Reversible vibratory plates work well on granular soils or with granular-cohesive mixes. With two eccentric weights, the vibration can be reversed to move the machine forward or backward or to stop to compress a single soft spot. For the money, these are good machines due to their versatility. Rammers are great for compacting cohesive soils and in confined areas. 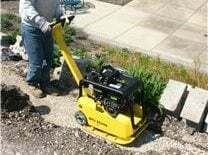 Wacker Neuson Vibratory plate compacters work well for compacting granular soils. Read more on compaction requirements for concrete pavers. So we've finally got the subgrade compacted and the subbase and base course placed and compacted. But what happens if there is a delay at this point before the concrete is placed? If the subbase gets rained on or frozen prior to concrete placement, it can go from being ready to being too soft. 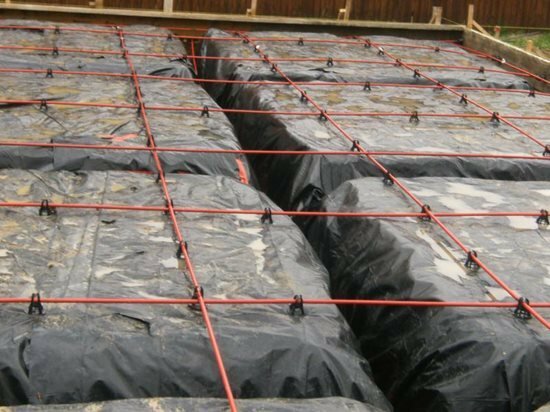 For most interior slabs, the vapor barrier should be placed on top of the subbase before placing the concrete. The best way to know if the subbase is properly compacted and ready for the slab is by proof-rolling, which is running a heavily loaded truck (such as a fully loaded concrete truck) across the subbase immediately before placing the concrete to see if any areas sink more than others. This should be done on some sort of grid pattern and the tires should not sink into the surface more than ½ inch. 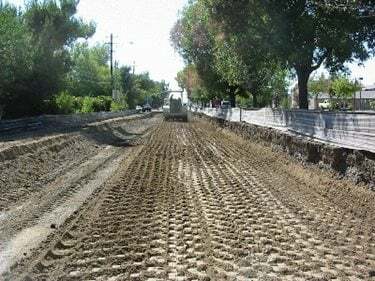 If there is any rutting or pumping of water in any part of the subbase or subgrade, then that area needs more compaction or addition of granular materials—or simply to be allowed to dry out. In the worst cases, trenches or sumps can be cut and the water pumped out. Just prior to placing the concrete, you may also want to place a moisture barrier. For interior floors, the best location is usually between the base course and the concrete. For more on this see Vapor Barriers for Concrete Slabs. 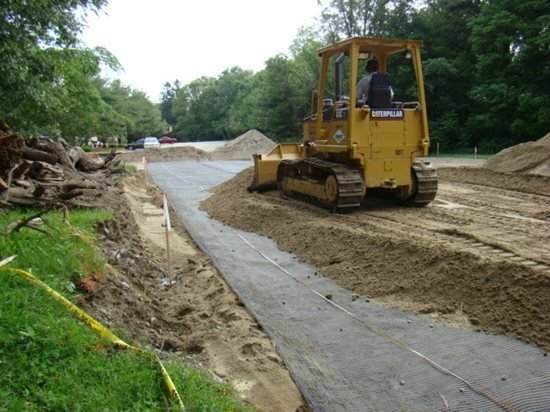 Learn more about proper subgrade preparation for commercial floors and driveways.